In 1921, Oregon lumber magnate and philanthropist, Simon Benson, speaking of the regions' fledgling tourism industry, observed, in part: "We have built good roads and invited the world to come view our beauty spots, but we have done nothing toward taking care of them after they arrive." 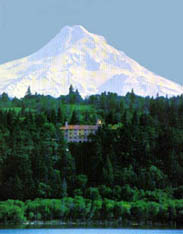 In response to that need, Benson built the Columbia Gorge Hotel. The Hotel property, once a Native American meeting ground, was the site of Phelps Mill in the mid 1800's, after whom our creek is named. The mill made staves for the whiskey barrels carried by mules from Hood River to the east. 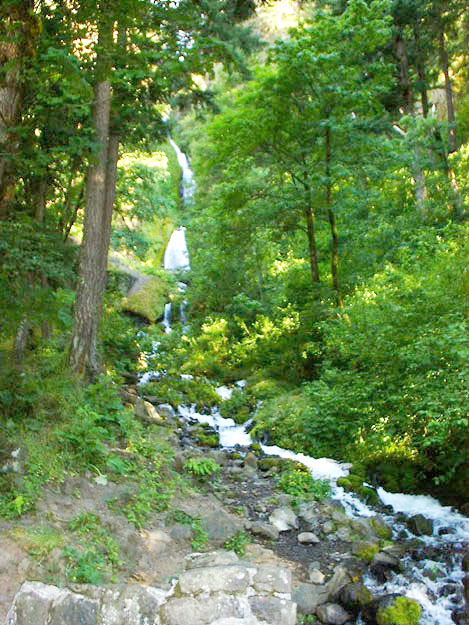 Then in 1904, Hood River pioneer Robert Rand capitalized on the area's spectacular beauty by constructing the Wah Gwin Gwin Hotel, named for the 207' waterfall on the property. The hotel operated successfully as a summer resort for 17 years, until Simon Benson tore it down to make way for his new Hotel. 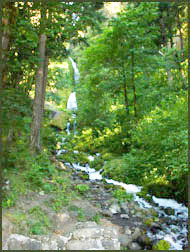 The layout of the grounds and trails, developed by Rand, remained the setting for the new Columbia Gorge Hotel. Designed by Portland architect Morris H. Whitehouse as the "Hotel Benson", the Hotel was under construction for less than a year. The Italian Stonemasons brought over to work on the new Columbia River Highway built the stone walls and bridges for Benson's new "Waldorf of the West". The "wooden" Beams so visible in the public areas are actually made of plaster and required five artisans, working in concert, to construct. 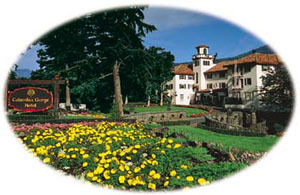 On June 21, 1921, the Columbia Gorge Hotel opened with a grand reception and quickly developed an international reputation. Notable visitors in the early years included Presidents Roosevelt and Coolidge, actresses Clara Bow, Myrna Loy, Jane Powell, and Shirley Temple. 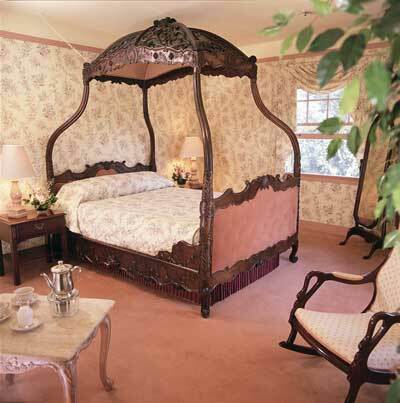 The Hotel is rumored to have been a favorite hideaway for Rudolph Valentino, after whom our Valentino Lounge is named. 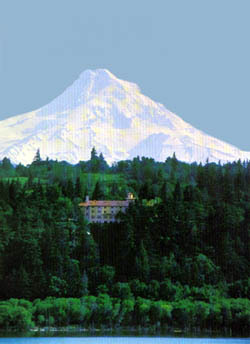 During the depression, the Hotel fell on hard times and was purchased by the Neighbors of Woodcraft as retirement home. Such it remained for a quarter of a century, until the ongoing restoration began in 1977. Privately owned and operated, the Columbia Gorge Hotel continues to be an elegant retreat in the heart of the Columbia Gorge National Scenic Area. Renowned for its dramatic surroundings and award-winning cuisine, the Hotel is the perfect place for an extended escape or a memorable evening. Visiting Mount Hood Railroad and enjoying the beautiful landscape are two of the many attractions that bring visitors to the Columbia River Gorge.